Not only is canoe fishing a relaxing hobby, but it also offers advantages such as the ability to quietly meander through difficult to reach areas without frightening game fish. 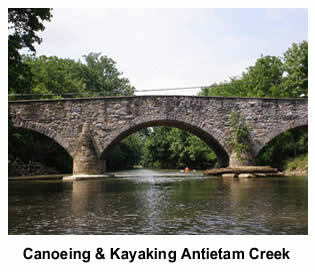 Having the right canoe can maximize your canoe fishing experience. Comfort, versatility, stability, and the ability to maneuver through your desired destination are among the most important features in a fishing canoe. For the solo fisher, Old Town offers the Pack Angler canoe. At 33 pounds, this canoe’s light weight makes loading, unloading, and transport easy. The Pack Angler’s weight is attributed to Royalex, the light, yet highly durable material of which it is made. Navigating through the tightest waters is easy for this 12 foot canoe. For comfort and added stability, the Pack Angler canoe comes with a lowered contoured seat with adjustable backrest. Another solo fishing canoe offered by Old Town is the Predator C133. It is a modified version of the popular Predator canoe that has been shortened for enhanced maneuverability. The Predator C133 has a bow-mounted anchor system, and it also accommodates side motor mounts. For family fishing trips, Old Town also offers the Saranac 146 Angler Canoe. This canoe paddles betters than most recreational canoes, and it has more built-in conveniences for the avid fisher. The interior of the Saranac 146 Angler edition has two contoured seats and an additional bench seat with storage, as well as molded-in upholders at the bow, center, and stern and molded-in storage trays. The family-sized fishing canoe also features molded-in rod holders at the bow and center, molded-in paddle rests at the bow and stern, and a bow-mounted anchor system. Mad River also offers the Angler 14, a quick, 14 foot canoe that is suitable for the calmer waters of lakes and ponds. While this canoe is not particularly suited for travel-intensive canoeing expeditions, the Angler 14 is very well-suited for sportsmen. This canoe is also made of Royalex and provides insulation from cold water. If you are new to canoe fishing and just beginning to learn to paddle, the Angler 14 is extremely stable and allows for a learning curve. This makes the Angler 14 excellent for children who are new to canoe fishing. Mad River offers the Angler 14 with a choice of either an aluminum gunwale or a new vinyl option. As you can see, when getting started in the sport of canoe fishing, one must consider several factors. Where will you be fishing? What comfort features are important to you? Will you be fishing alone or with friends or family? Will you be canoe fishing with children? Manufacturers offer many, many options to choose from when selecting a proper canoe, and each of these elements will factor into deciding on the fishing canoe that best fits your needs. 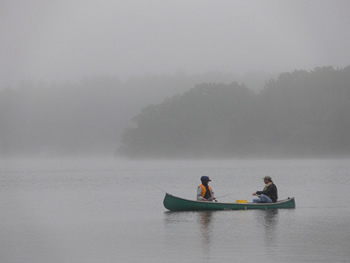 Canoe Fishing on Long Pond photo courtesy of Mr TGT on Flickr.